inscription: Lower left side of poster has "poster design by Helvetica Jones: garland kirkpatrick" and has a union label for Inkworks 147." Inside the image is "circ 1993." 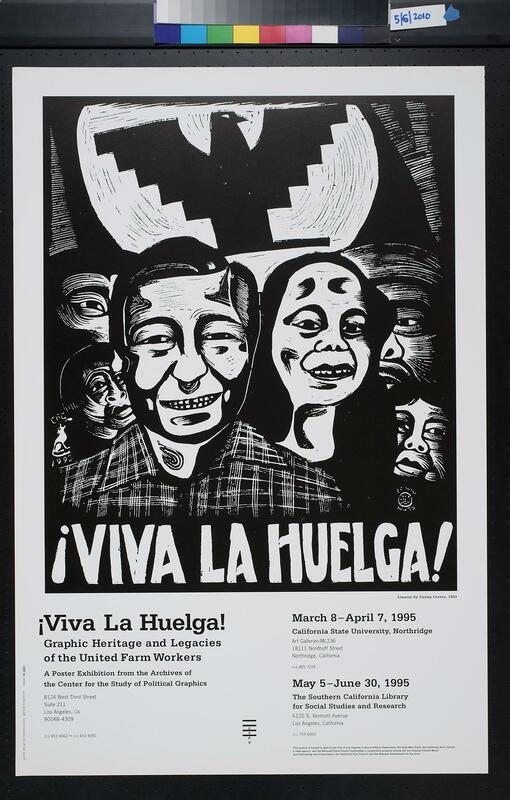 White poster with black print and image of humans with the bird logo of the United Farm Workers of America in the background. Along the bottom of the image is "Viva La Huelga!" and in the lower right corner is "Linocut by Carlos Cortez, 1993." Text in bottom half of poster reads "Viva La Huelga! / Graphic Heritage and Legacies / of the United Farm Workers / A poster exhibition from the Archives of / the Center for the Study of Political Graphics...March 8-April 7, 1995 / California State University, Northridge...May 5-June 30, 1995 / The Southern California Library / for Social Studies and Research..."